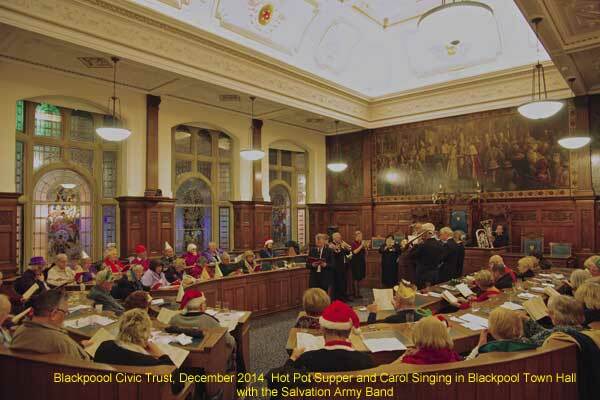 By tradition the December Members meeting is largely given over to a hot-pot supper and Christmas carols led by the Salvation Army's excellent brass band. This year, however, was a little different. The hot-pot supper was as good as ever and so, too, was the brass band. 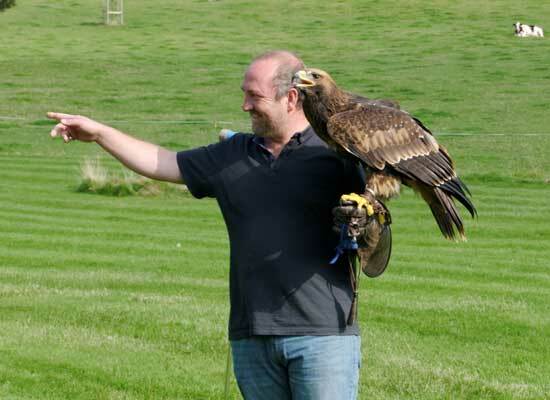 But our Vice-President, Cllr David Owen, had a few surprises up his sleeve. David is a trustee of a bequest set up for charitable purposes and he made four very generous financial contributions over the course of the evening. 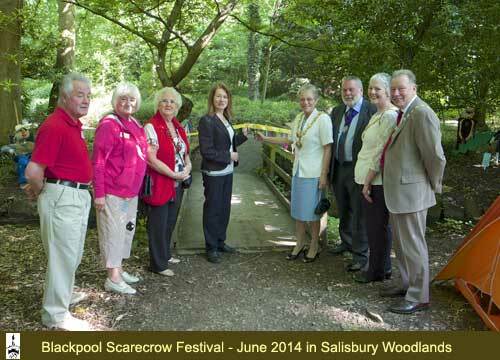 Two donations of £500 each were made to The Friends of Stanley Park and the Civic Trust itself. But the best was saved to last. Just before the final carol David presented Major Paul Fisher with a cheque for £1000 and with a second cheque of £1000, specifically, to fund the Salvation's Army's Bridge Project here in Blackpool. It was a very fitting end to an evening of celebration. 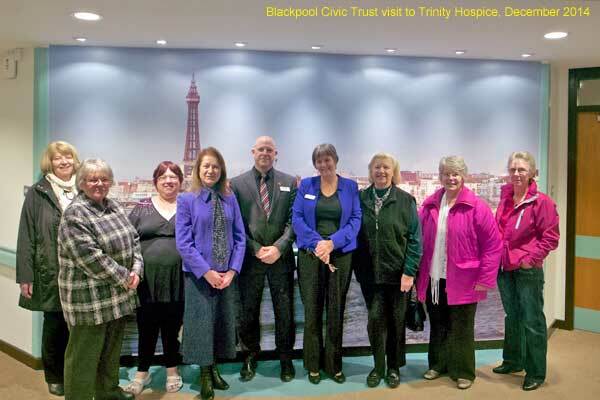 Blackpool Civic Trust visited Trinity Hospice. Here are our photos. 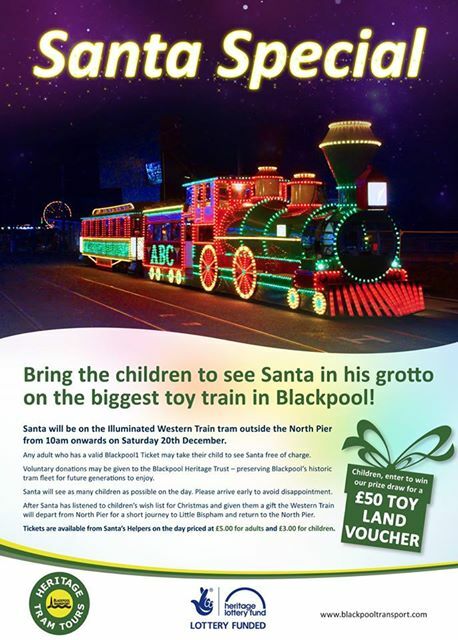 Blackpool Heritage Trams are operating a Santa Special on Saturday 20th December outside North Pier with a journey later in the day. 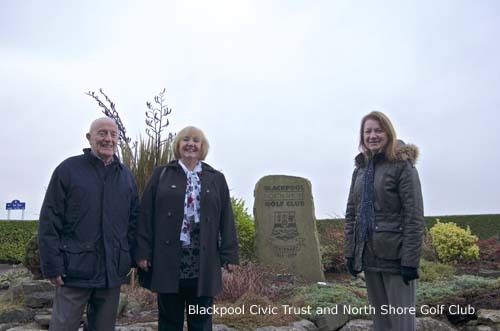 We are very pleased to announce that Blackpool North Shore Golf Club, which can trace its origins back to 1904, has just become our latest Corporate Member. 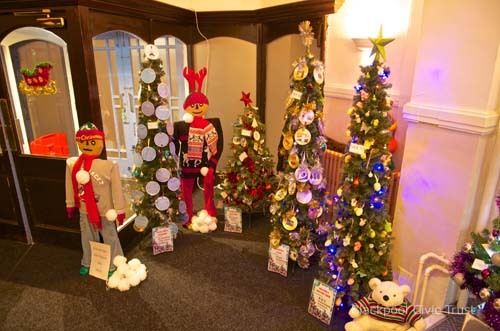 The Civic Trust submitted an entry to the Christmas Tree competition organised by the Winter Gardens Trust. 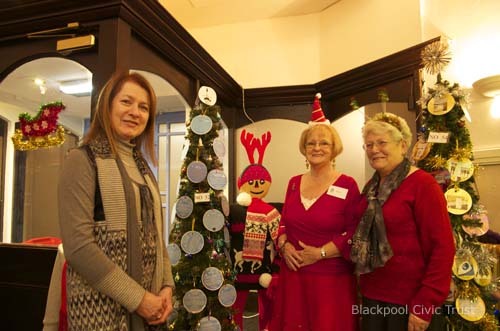 Many thanks to Betty Bradford who conceived the idea of a heritage-themed Christmas tree decorated with blue plaques. 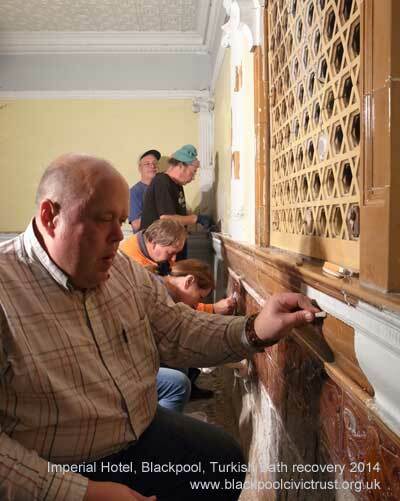 There was an excellent turn-out of members and much progress was made exposing the tiles of the Imperial Hotel's old Turkish baths. Some members managed to attend 3 out of the 6 sessions organised over 3 days. Impressive stuff. Many thanks to everyone who volunteered to help on this important and exciting on-going project. More sessions will be organised in the new year. 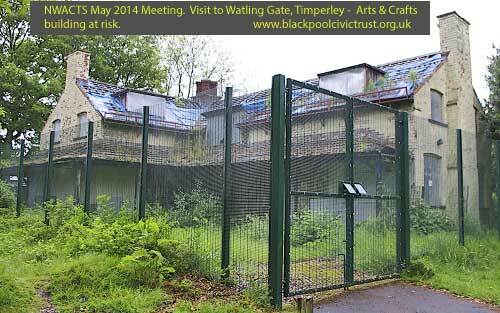 Details will be posted on the website and announced at our regular meetings for members, when they become available. Photographs of a few of the members who volunteered. 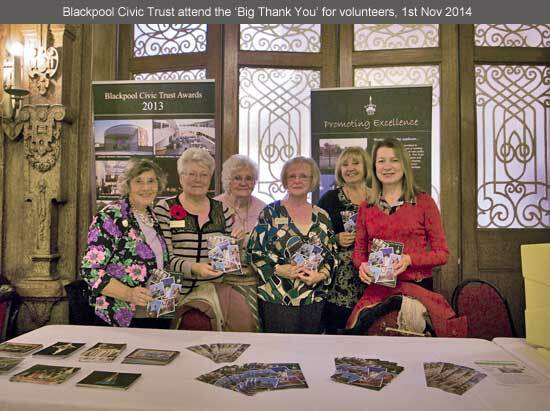 Members of the Civic Trust had a stall in the Winter Gardens, whilst attending the BIG THANK YOU event put on for local volunteers from many different organisations. 1st November 2014. 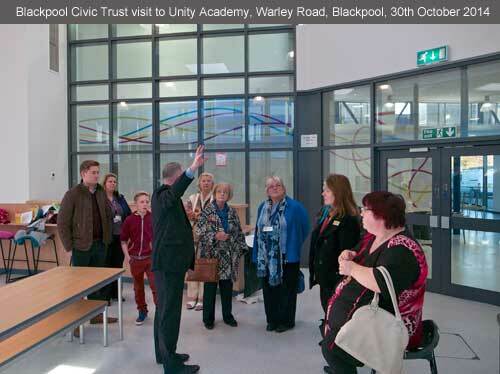 Members of the Civic Trust were given a highly instructive and interesting tour of Unity Academy. Unity is unusual in taking pre-school children all the way through to sixteen years of age and educating them on one site. The Academy has recently been extensively refurbished and Mr Lickiss, the Principal, took great pride in explaining many of these improvements, including major upgrades to the various science labs. The art and design rooms also could boast some impressive equipment, including an amazing 3D printing machine. We were shown some of the small objects made or “printed” by this machine from plastic and were duly impressed. Our thanks to Mr Lickiss for a most enjoyable tour of the Academy. It was evident from everything we heard and saw that Unity fully intends to live up to its name. 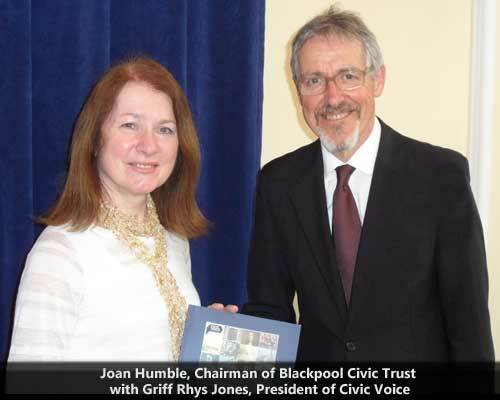 Joan Humble, Chair of Blackpool Civic Trust and Trustee of Civic Voice, joined Campaigner and President of Civic Voice, Griff Rhys Jones, to launch the first ever national Civic Movement manifesto at the start of the annual Civic Voice convention. The launch took place at Westgate Hall, Canterbury, October 2014. Griff said “We face a crisis of civic engagement. We need to give all citizens opportunities to actively shape the future of their place and to give communities the powers they need to enable their town and city centres to prosper”. Joan spoke at the AGM in Canterbury urging local civic societies around England to campaign on the manifesto and contact MPs and candidates in next year’s General Election. 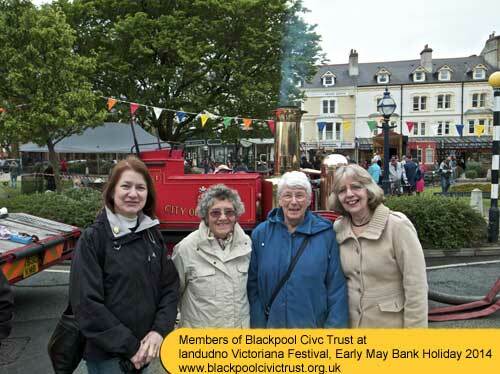 Joan Humble added “ We regularly hear political parties talking about “localism “. 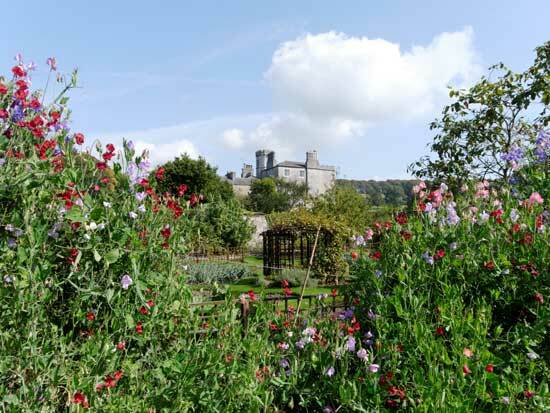 This manifesto, which has the backing of thousands of civic society members, challenges politicians of all political parties to listen to the views of local people and involve them in decisions about the places they live in. 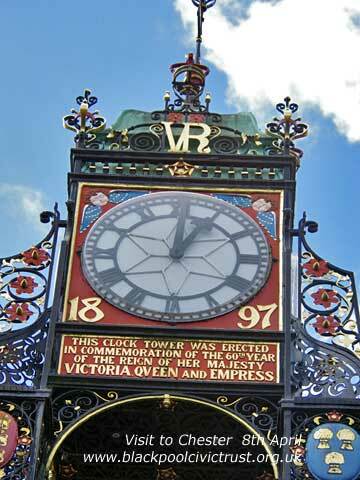 Civic Voice works to make the places where everyone lives more attractive, enjoyable and distinctive. We speak up for civic societies and local communities across England. 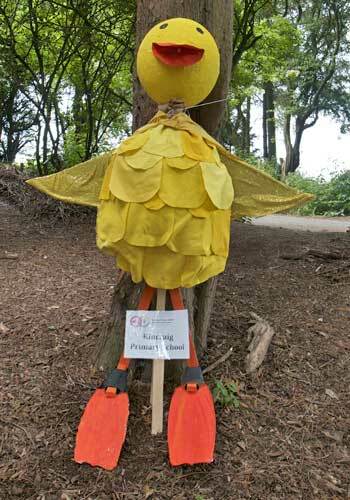 We promote civic pride. 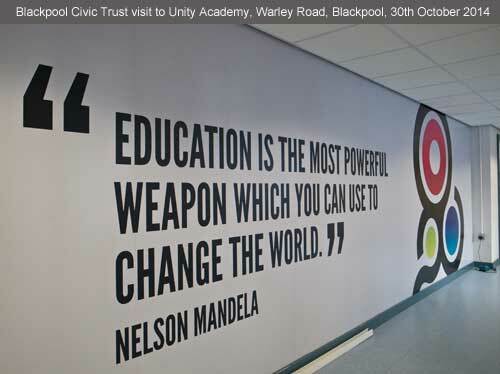 We are the national charity for the civic movement and have a strong local presence. We believe everyone has the right to live somewhere they can be proud of. We know how people feel about places because we feel the same way. Civic societies are the most numerous participants in the planning system. 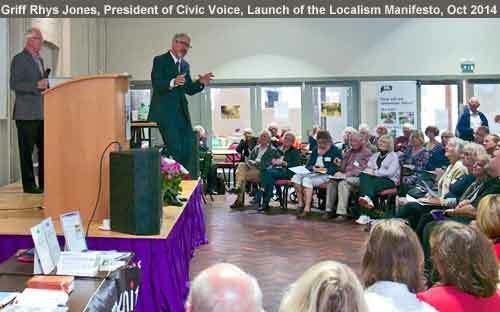 Since its launch in April 2010 Civic Voice has been joined by 290 civic societies with more than 75,000 members. Further information is available at www.civicvoice.org.uk including how to join Civic Voice (£10 individuals) and contact details for local civic societies. Blackpool Winter Gardens, 1st October 2014. 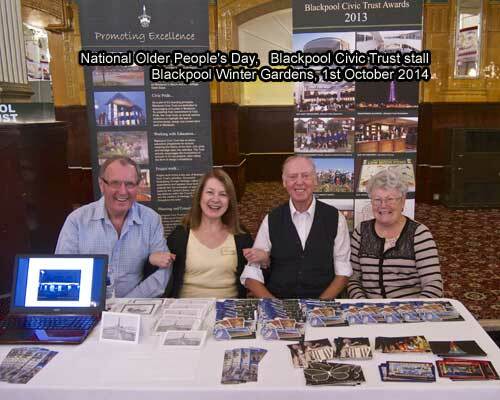 Blackpool Civic Trust had a stall at the National Older People's Day. 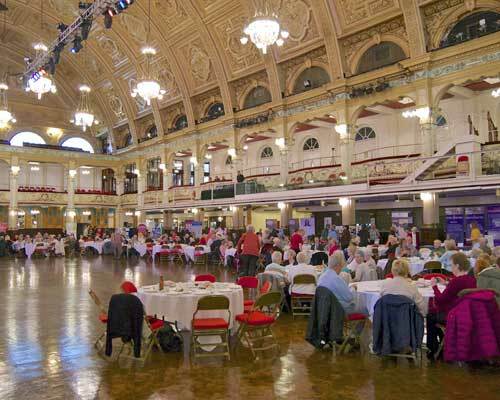 The Civic Trust took part in the National Older People's Day event in the Winter Garden's Empress Ballroom. At our stall we dealt with many enquiries and gave membership forms. Two hundred and thirty people attended this successful event and there were in addition to the many interesting stalls, a demonstration by local artist print maker, Robin Ross, a performance by the Revoe-Lution Community Choir, dancing and a demonstration of the newly-restored Wurlitzer based organ. 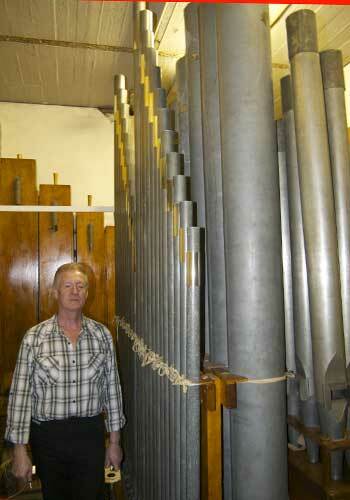 Cannock Chase Organ Society was responsible for carrying out over several years the overhaul and renovation of this impressive instrument and it was a great pleasure to hear it in back in action. 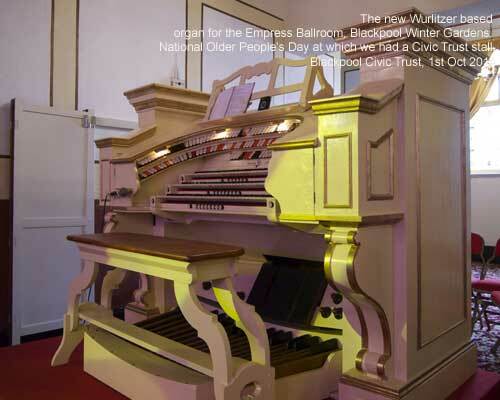 There are two other fully-working Wurlitzers in Blackpool, one in the Opera house and the other in the Tower Ballroom. 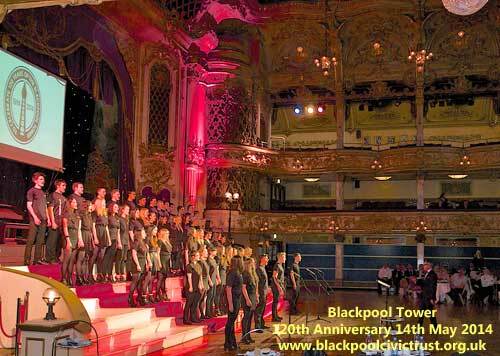 Blackpool Civic Trust opened up Blackpool Town Hall to groups of excited school children on Friday 12 September as part of Heritage Open Days. 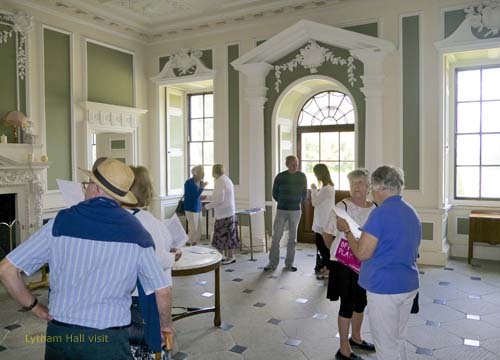 On Saturday 13 September, 38 people from all around the country visited the Town Hall. 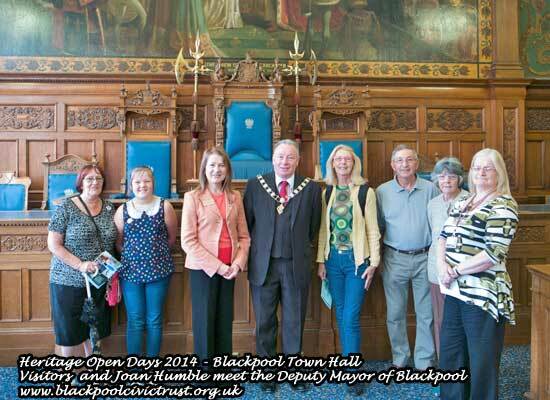 The Deputy Mayor of Blackpool, and Joan Humble of Blackpool Civic Trust meet visitors to the Town Hall. On the right Councillor Christine Wright. 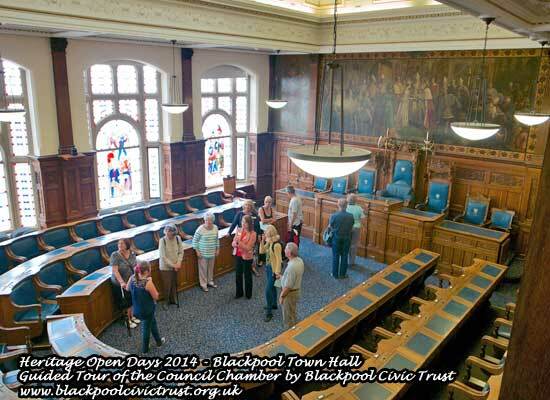 Blackpool Civic Trust show visitors round the Blackpool Town Hall Council Chamber. We had a very enjoyable trip to Kendal followed by Leighton Hall. It was interesting to explore the “Yards” of Kendal, which played a part in safeguarding the town against the worst excesses of twentieth-century redevelopment schemes. Kendal Civic Society should be congratulated on their excellent and highly prominent green plaques. We were given an instructive and entertaining guided tour of Leighton Hall. The highlight of the tour was of course the original Gillow furniture seen in every room. It remains to this day as functional, practical and elegant as ever and was a joy to see and handle. 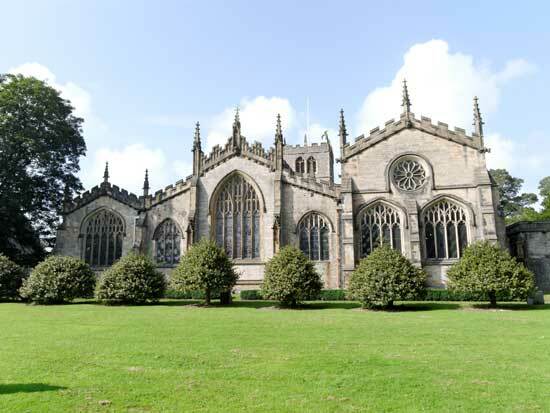 The largest parish church in Cumbria built mostly in the 18th century on a site of worship dating back to the 13th century. Seen from the river bank. 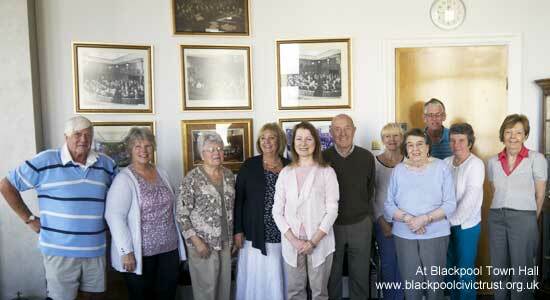 There was a good turn out of members for the annual polishing of the Town Hall silver collection. Everything shone and sparkled by the time we had finished. 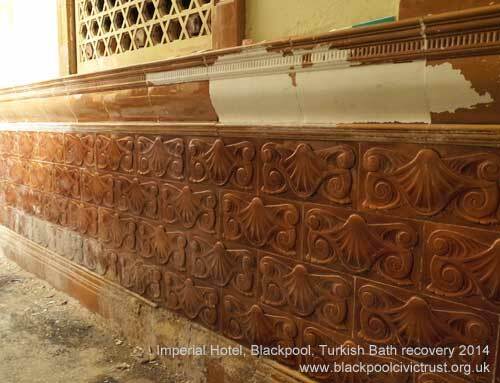 Members of Blackpool Civic Trust have joined in a project to uncover and expose the tiles in the former Turkish Baths in the Imperial Hotel. In 1901 a suite of Russian, Turkish and seawater plunge baths were built in the basement of the former wing of the hotel. The Turkish baths disappeared during major refurbishments in the 1960s. 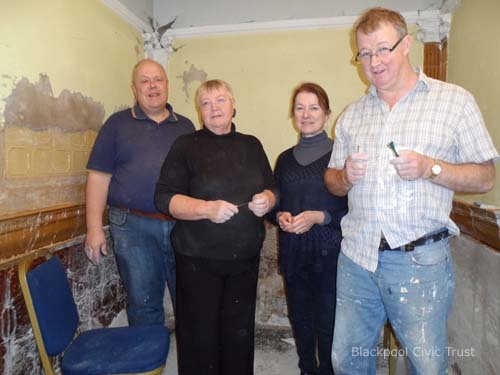 Joan Humble, Chair of Blackpool Trust, joined other Civic Trust members to uncover the baths. 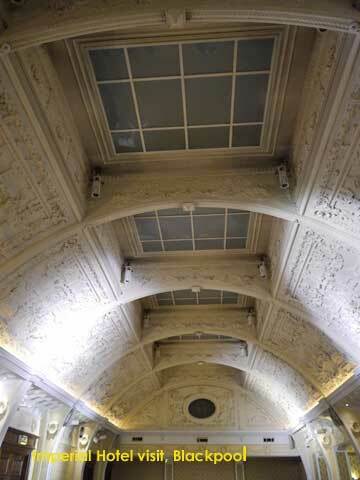 She commented “After nearly 60 years it is wonderful to see something of the former Turkish Baths reappearing once again. 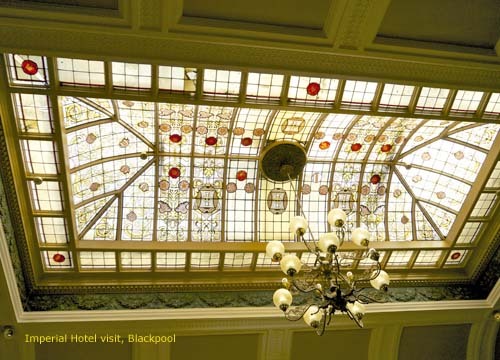 We are very pleased to work with the Imperial Hotel and Mr Andrew Gladwell to reveal this part of Blackpool’s heritage. After just two days work we can see some of the amazing glazed tiles produced by the famous Burmantoft Pottery in Leeds. I must thank those who helped and the Civic Trust hopes to continue working with the Imperial to reveal even more of this part of its past”. 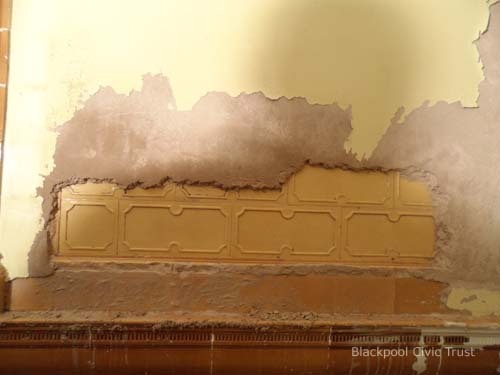 The Imperial was open for tours on Thursday as part of Blackpool’s Heritage Open Days and over 70 people who registered for the tour were lucky enough to be the first members of the public to see the discovery. Alison Gilmore, General Manager, said “I’m thrilled at the discovery of the tiles and can’t wait to see the development over the next few weeks. 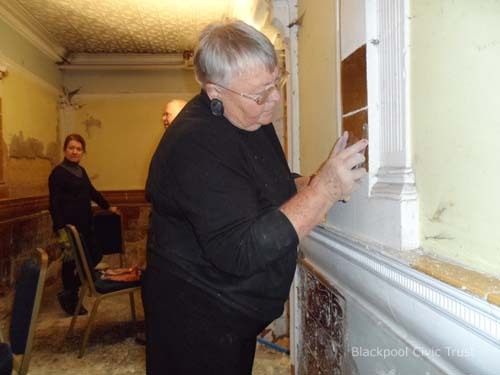 Thanks so much to the support and enthusiasm of Blackpool Civic Trust and Blackpool Heritage who’ve been getting down and dirty in our Turkish baths”. 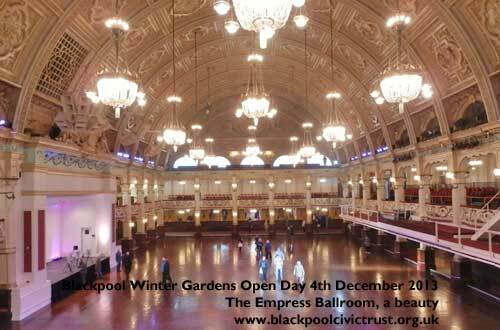 11th November at the Winter Gardens a free seminar related to local listing and protecting historic assets by Civic Voice, Blackpool Council, English Heritage and The Winter Gardens Trust. 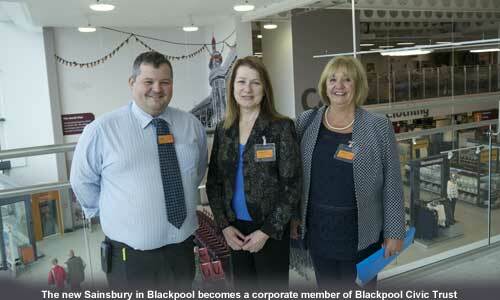 The new Sainsbury on Talbot Road is set to become our latest Corporate Member. Its Deputy manager, Ian McGawlay, is seen here with Joan Humble and our Corporate Members Officer, Christine Lamb. 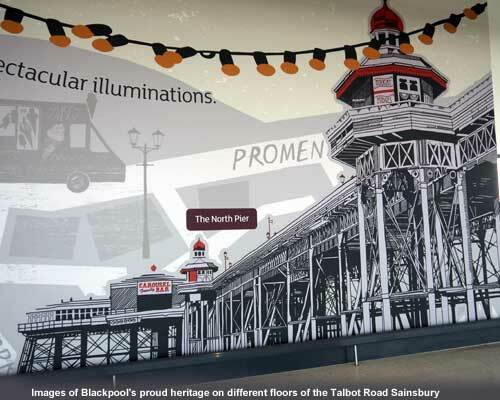 Ian showed us the impressive wall-sized images of Blackpool's proud heritage on different floors and explained how the Talbot Road Sainsbury is the first to showcase local heritage in this way. What better place to start than Blackpool! Bob Taziker, our Planning Officer, has stood down from his role because of ill health. Bob has offered us excellent advice over many years and will be very much missed. We offer our best wishes to him and his wife. Bob will be replaced on the Committee by Canon Andrew Sage who will be our Planning Officer as well as his existing role as the Faith Buildings Officer. 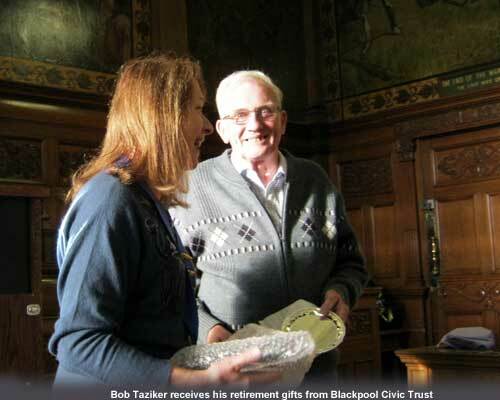 In recognition of his long years of service and valuable contribution to the Civic Trust, Joan presented Bob with an engraved silver plate and a book on the Buildings of North Lancashire by Nicholas Pevsner. 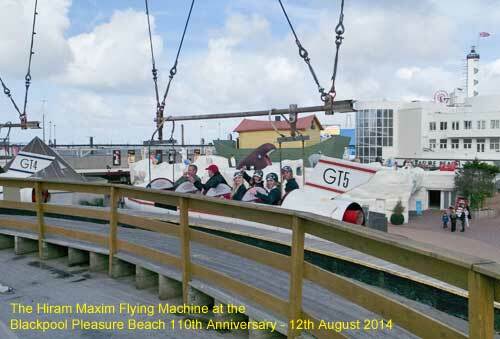 A group from Blackpool Civic Trust had a great time when they visited and rode the Hiram Maxim Flying Machine which was celebrating its 110th birthday at Blackpool Pleasure Beach. 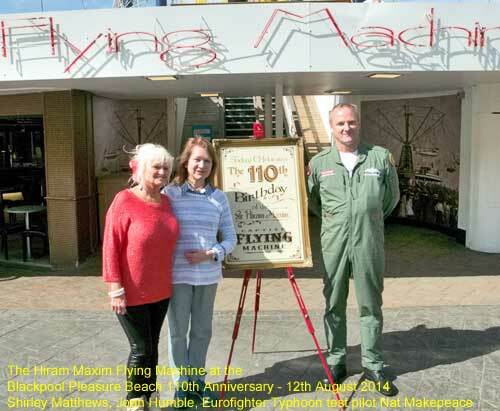 Nat Makepeace, Eurofighter Typhoon pilot from nearby BAE Systems was present, below is a photo of Nat with Shirley Matthews and Joan Humble our Chairman. Strapped in ready for take off. 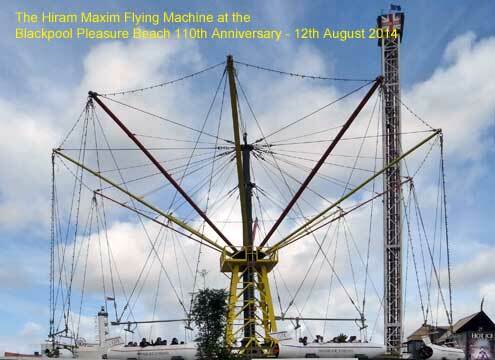 The Hiram Maxim Flying Machine on Blackpool Pleasure Beach in all its glory. 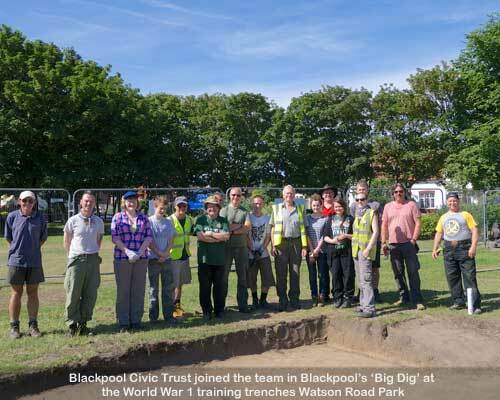 Some members of the Civic Trust have volunteered to take part in "The Big Dig", which is a "community archaeological dig of the Loos First World War training trenches at Watson Road Park". We were lucky to be selected as the dig was massively over-subscribed, with people as far afield as Liverpool wanting to take part. 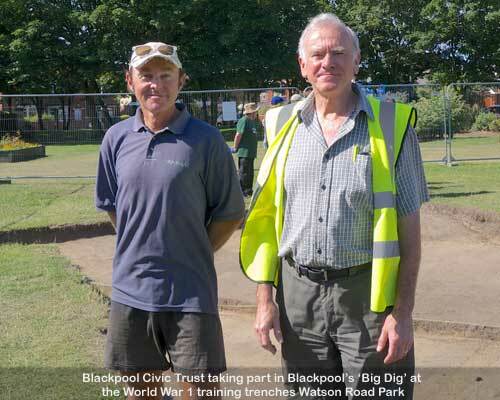 Watson Park Road is one of three known sites of training trenches in Blackpool. It was unique in being open to the public (from 1916), who were given guided tours. The partially excavated trenches will once again be open to the public on 3rd August, 2014. 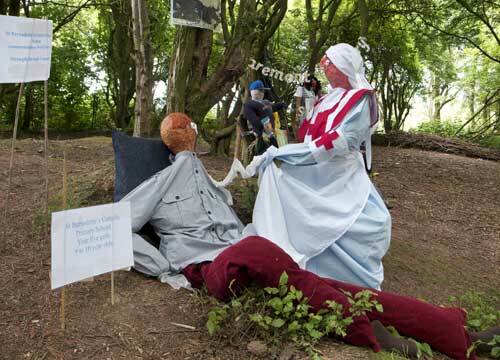 In the meantime, you can visit the excellent exhibition at the Park, which is now open and explains the background to the Loos practice trenches. 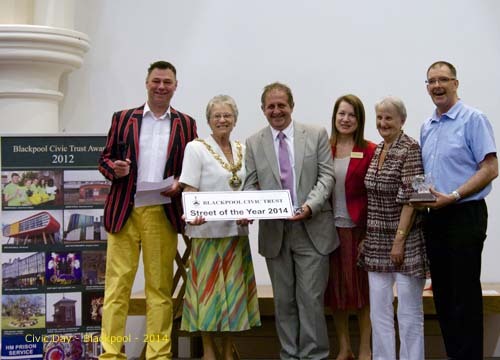 Civic Day, a celebration of civic pride, was held around the country on Saturday, 21st June. 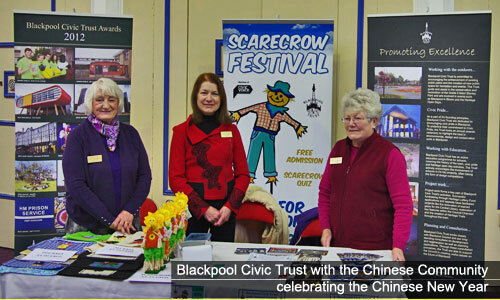 Blackpool Civic Trust celebrated in style with entertainment, stalls and the presentation of prizes in St John's Church. 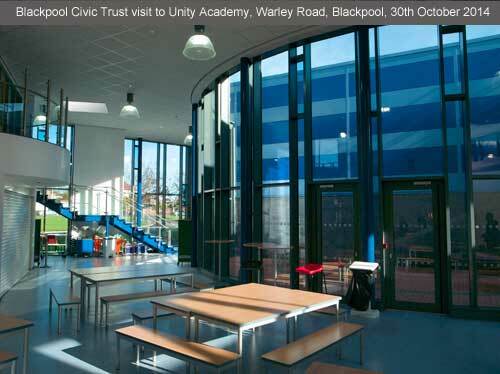 Joan Humble, Chairman of Blackpool Civic Trust, said: “My thanks go to Gordon Marsden MP for opening the event, to the Mayor of Blackpool, Coun. 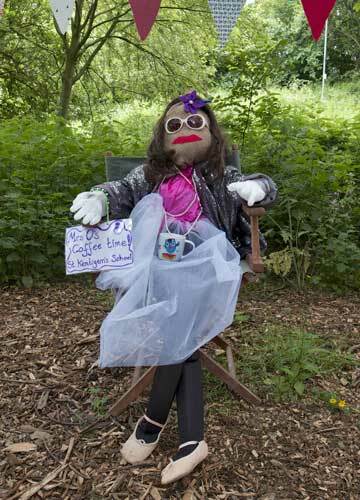 Val Haynes, for presenting prizes to the winners of our scarecrow competition and also the 'Best Kept Street' winner and to all those who came and supported us”. 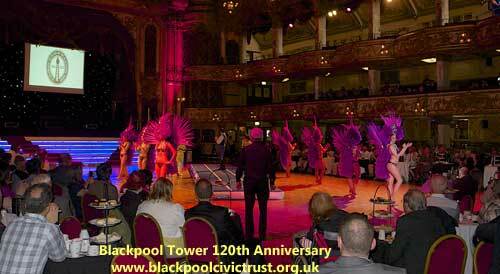 Opening Blackpool Civic Day. 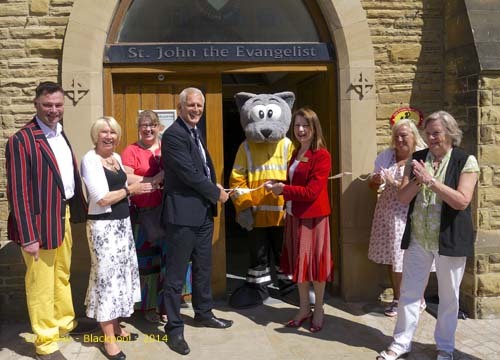 Cutting the tape outside St John's Church entrance from left to right: Andy Mitchell, Carol Tyler (church member), Helen Kaye (Groundwork), Gordon Marsden MP, “Big Cat”, Joan Humble (Civic Trust Chairman), Eileen Ormand (BID manager), Marjorie Nye (Winter Gardens Trust). 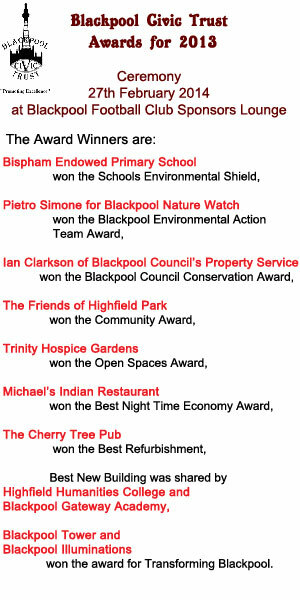 Best Street award won by Bairstow Street in Central Blackpool. From left to right: Andy Mitchell. Mayor Coun. 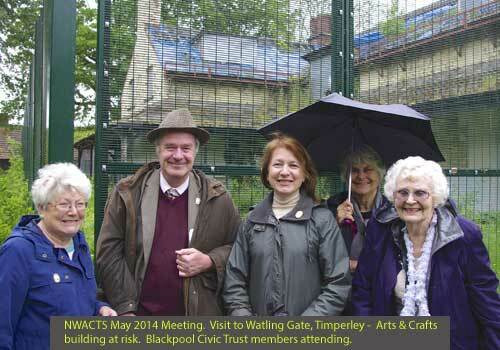 Val Haynes, Nick Osborne (Bairstow St), Joan Humble (Civic Trust Chairman, Barbara Hardy, Coun. Graham Caine. Councillor Christine Wright, Culture & Heritage Cabinet Member on Blackpool Borough Council, made a discovery at the special exhibition at the Gallery in Booths, Lytham. 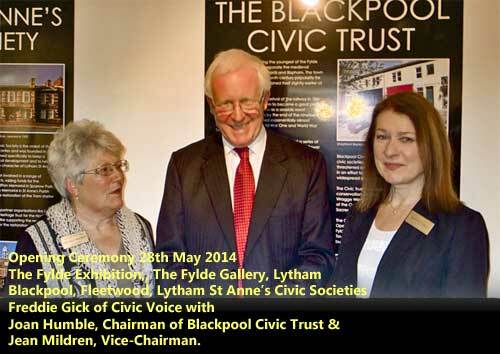 Councillor Mrs Wright and her husband, David, attended the opening of the exhibition, which had been jointly organised by Blackpool Civic Trust, Lytham St Annes and Fleetwood Civic Societies. 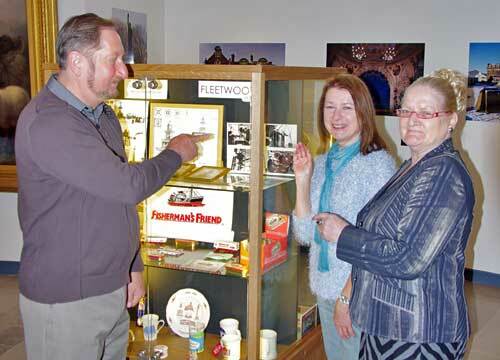 David noticed an old newspaper photograph of his grandfather, Tom Hornby, in a display cabinet about the Fleetwood lighthouses. 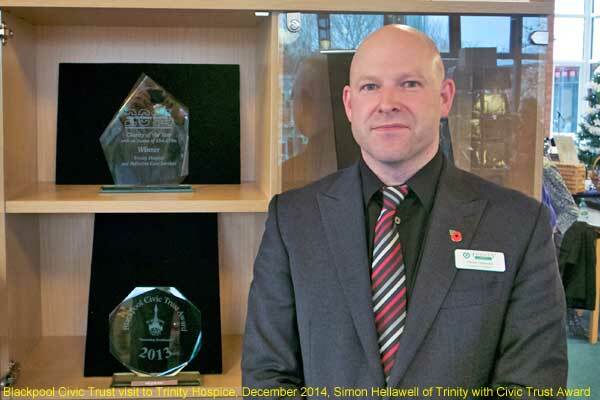 Mr Hornby was featured with colleagues from the Wyre Light. 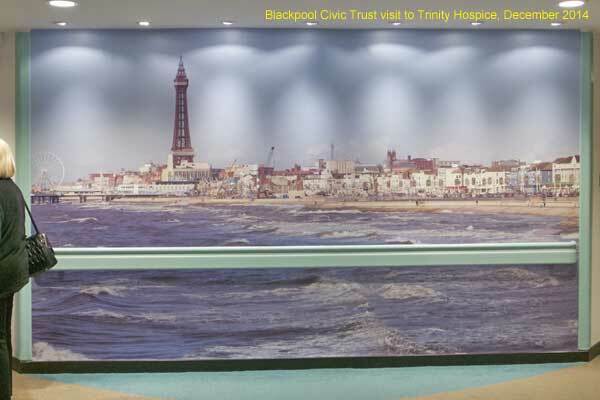 The Chairman of Blackpool Civic Trust, Joan Humble, added that “the joint exhibition has many photographs of buildings from the three towns, but also in the case of Tom Hornby tells a human story that lives on in his grandson, David Wright. 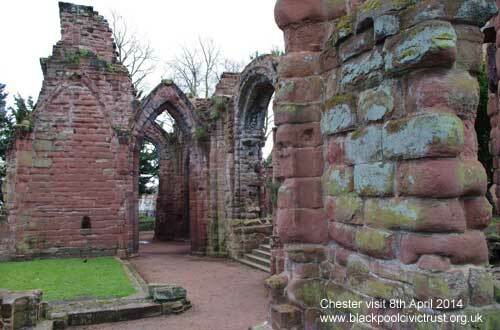 It is a reminder that History and Heritage are as much about people as buildings”. 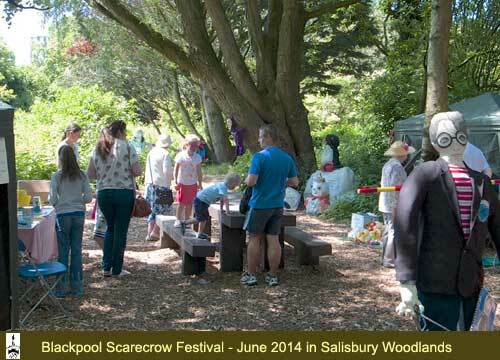 Prizes for the Scarecrow Festival were awarded at the Civic Day Party on 21st June 2014. 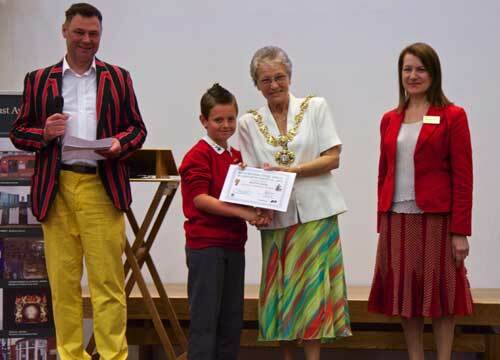 Andy Mitchell, Kincraig School pupil, Mayor, Coun. Val Haynes, Joan Humble (Civic Trust Chairman). 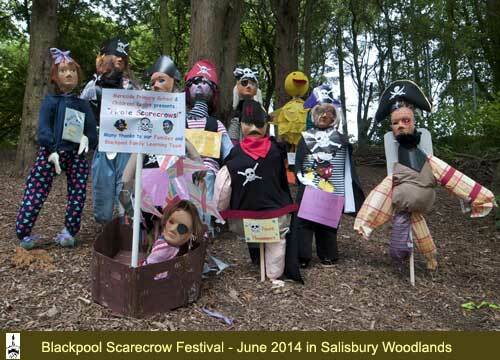 Blackpool Civic Trust Third Scarecrow Festival took place in Salisbury Woodland on 14-15th June. 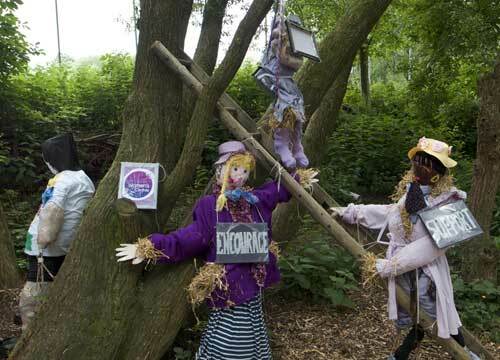 Civic Trust Chairman, Joan Humble, said: “The event was very successful with hundreds of visitors enjoying the sight of over 200 scarecrows, buying gifts and cakes from the stalls and, in the case of many of the children, having their faces painted. We held a competition for local schools and the awards for the winning entries will be given out on Saturday 21st June, national Civic Day, at our celebrations to be held in St. John's Church. I would like to thank the Mayor of Blackpool, Councillor Val Haynes, for officially opening the Festival and especially thank the volunteers who worked so hard over many months creating the wonderful displays. 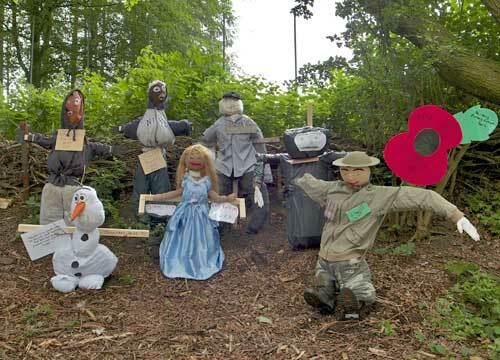 I would also like to thank all the schools who took part in the competition and whose imaginative scarecrows so impressed our judges. 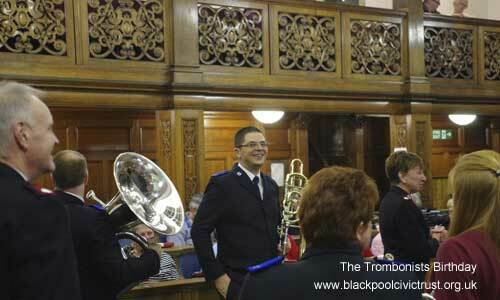 The event was opened by the Mayor of Blackpool, Councillor Val Haynes. In the photo: Danny Bradford; Betty Bradford; Elaine Smith; Joan Humble; Mayor Cllr Val Haynes; Mayor's Consort Alan Haynes; Deputy Mayoress Nicola Ryan; Deputy Mayor Chris Ryan. 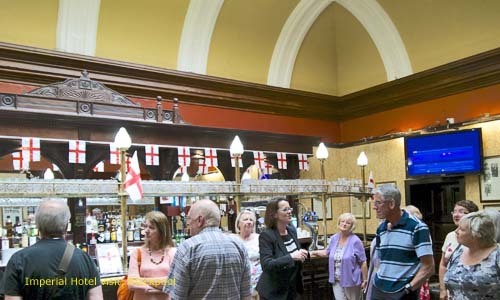 As part of our Civic Week, we visited the Imperial Hotel (Grade 2 listing) and had a highly instructive guided tour and illustrated presentation. The General Manager, Alison Gilmore, demonstrating her zeal for all things heritage explained some of the key features of the hotel's distinguished history. We were allowed to have a peek in the basement at what was left of the old Turkish baths when the hotel opened in 1867 as the "Imperial Hydropathic Hotel". Our afternoon was rounded off with a delicious cream tea. 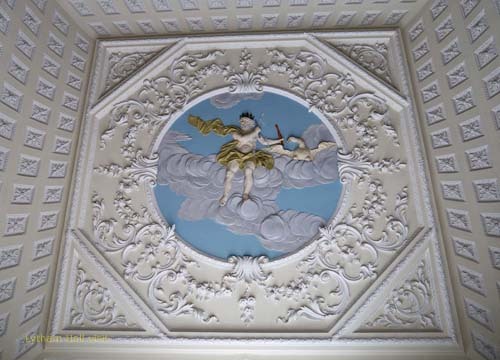 Blackpool Civic Trust visited the Fylde Coast architecture exhibition in Lytham and then, after refreshment, paid a visit to the splendid Grade 1 listed Lytham Hall with its breathtaking plasterwork. 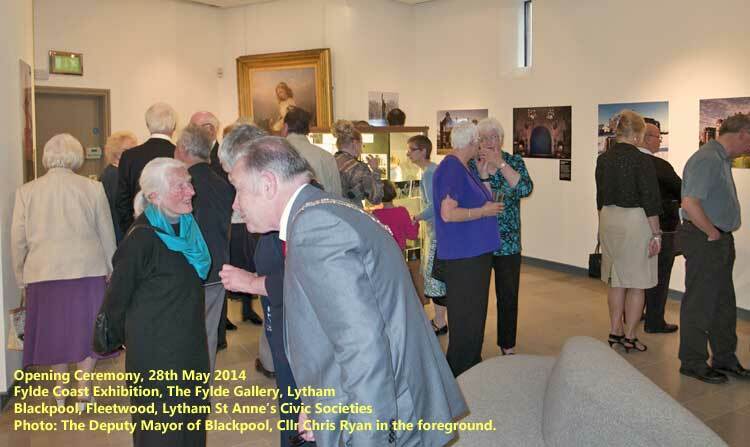 The Fylde Exhibition in the Fylde Gallery at Booths in Lytham was opened on Wednesday 28th May with the Chairman of Civic Voice, Freddie Gick, The Mayor of Fylde, the Deputy Mayor of Blackpool and the Deputy Mayor of Wyre. 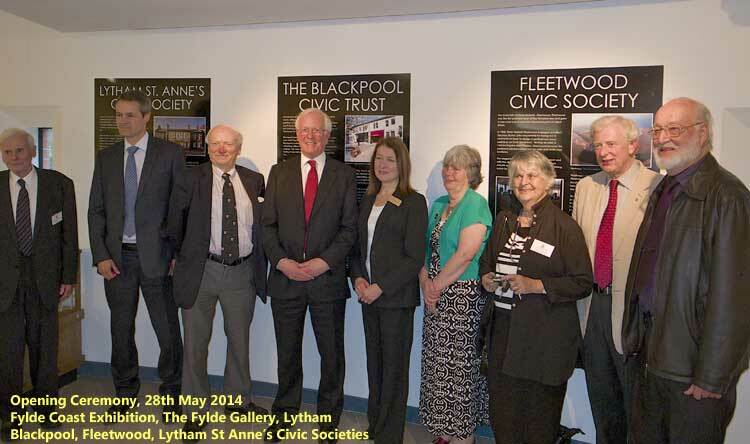 A joint exercise by the Blackpool, Fleetwood and Lytham St Anne's Civic Societies it contains photographs of significant architecture along the Fylde Coast. 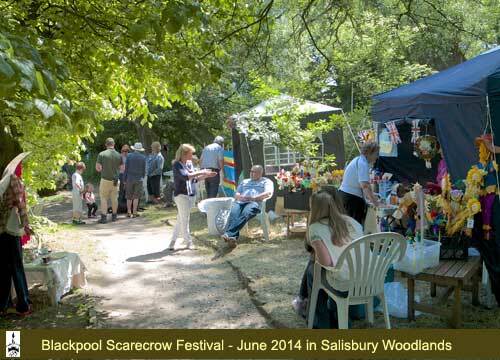 It is open to the public with free entry until 4th July 2014. 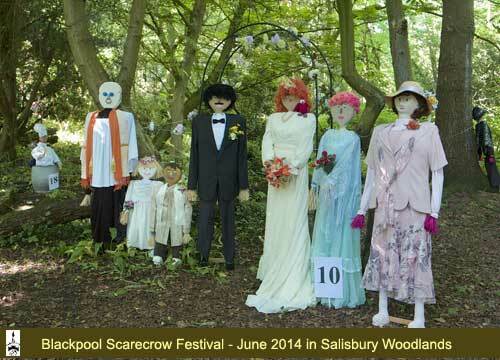 Blackpool Civic Trust presents the scarecrow festival on Salisbury Woodlands near Stanley Park. 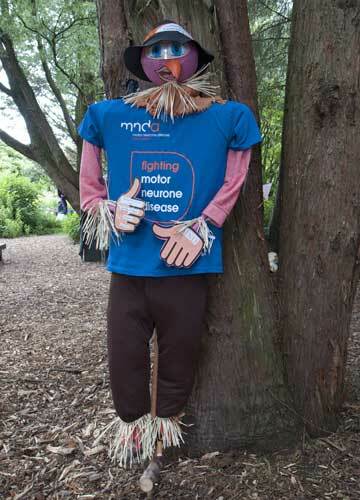 Please sponsor a scarecrow to help pay for the event. The May meeting was held in honour of the late Cyril Critchlow, magician, photographer, collector of Blackpool memorabilia. 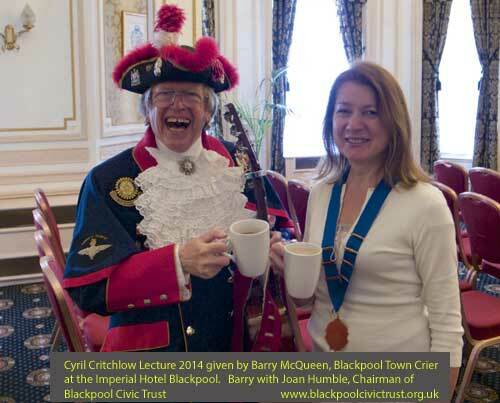 The Civic Trust invited Barry McQueen, Blackpool Town Crier and well-know local figure to give the Cyril Critchlow lecture. 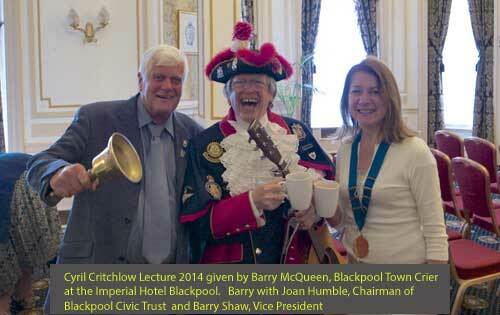 The Chairman of the Civic Trust, Joan, said: “We were very pleased that Barry McQueen could attend our meeting. He gave an amusing and highly entertaining account of his varied life as a Town Crier and treated us to a demonstration of his skills complete with bell ringing. The well attended event was held at the Imperial Hotel rather than our usual venue. Our thanks to the Imperial for graciously hosting the event and for looking after us so well. A number of our members attended the May meeting of NWACTS. 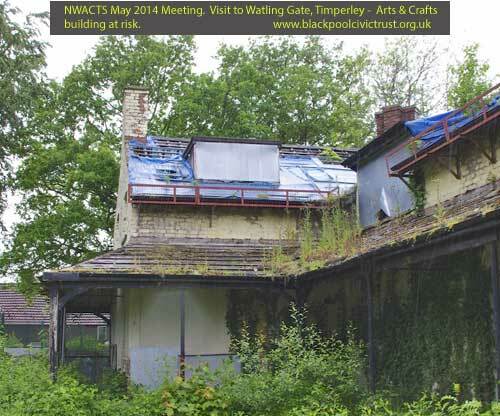 In the morning we enjoyed an excellent presentation on Watling Gate, a once very fine example of the Arts & Crafts movement, but now declared as NWACTS Building at Risk for 2014. We were given a 360-degree photographic tour of the building's interior room by room and could easily imagine how attactive and impressive the house would have looked when in regular domestic use. Unfortunately, the building fell vacant in 2003 and the structure is now in danger of collapse. A seminar on local listing and a walkabout of Timperley took place in the afternoon session, rounding off a very interesting, varied day. 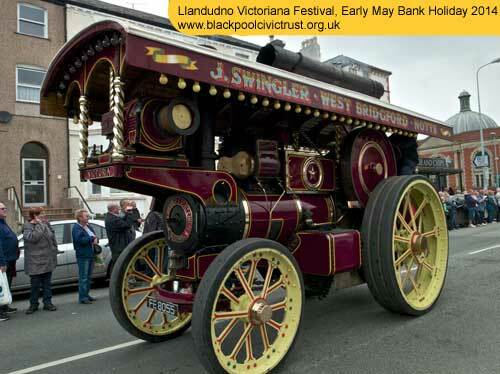 New South Promenade and the Solaris Centre feature Blackpool's great promenade vehicle show on Sunday 22nd June 2014 at 11am to 4pm. 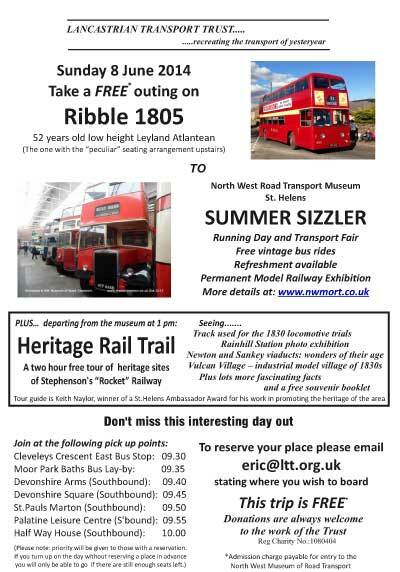 The show includes over 200 vehicles, Heritage Tram Tours, free vintage bus tours, entertainment, refreshments, stalls. Something for all the family. 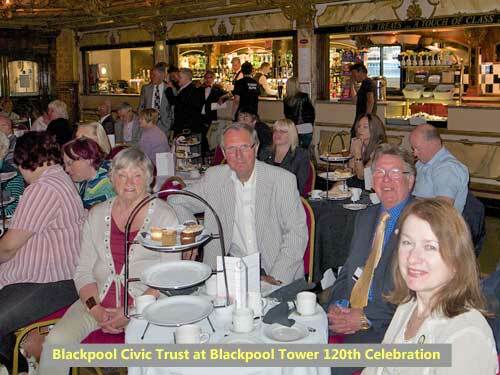 The Civic Trust was delighted to take part in helping to celebrate the 120th Anniversary of Blackpool Tower. We enjoyed a very entertaining afternoon, which featured a wide range of acts, dancers and choirs both professional and (highly accomplished) amateurs drawn from the Fylde. We enjoyed also a very pleasant afternoon tea complete with cream cakes. Although the accent was very much on entertainment, the afternoon proved instructive as well. 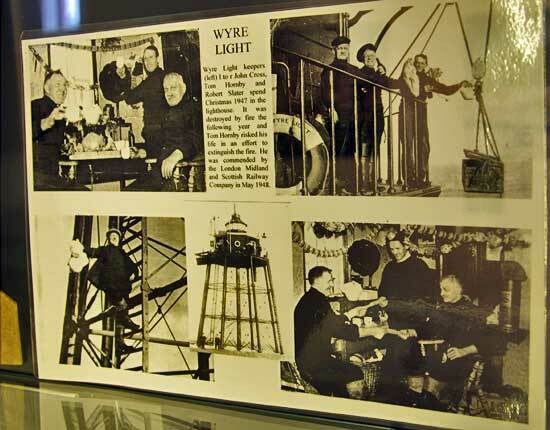 With a light, humourous touch we were given the key facts in the history of the Tower and how it has adapted to changing tastes and circumstances in order to maintain its enduring popularity. 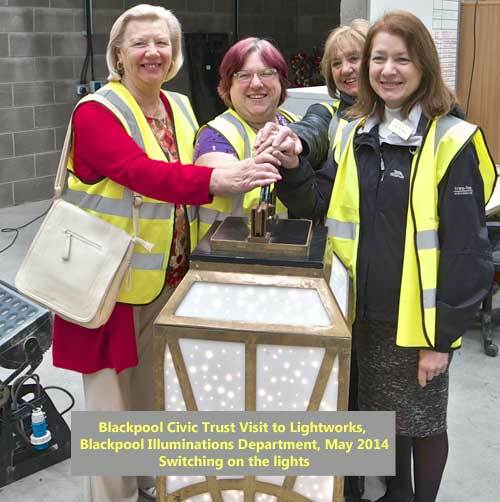 A large group of Civic Trust members were given a guided tour of the Lightworks Department and learnt about the skilled work involved in producing, maintaining and constantly updating the Illuminations that have helped to make Blackpool so famous around the world. We were able to ask the various craftsmen about their own area of expertise and were shown the machinery and computers they use daily. 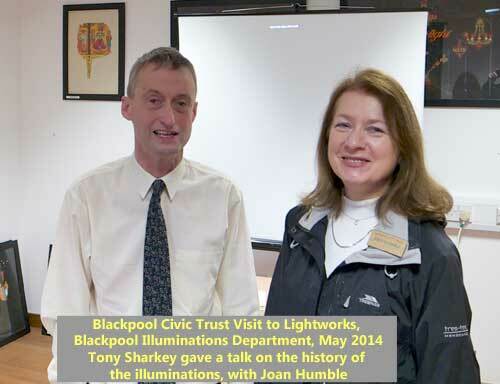 Prior to the tour we given an informative and richly illustrated presentation on the history of Blackpool's Illuminations by Tony Sharkey, local historian and librarian. We also had an opportunity to examine the fascinating artwork for the Illuminations stretching from the 1920s up to the present. Many thanks to the staff of the Lightworks Department, Tony Sharkey and his colleague for a most enjoyable visit and their kind hospitality. 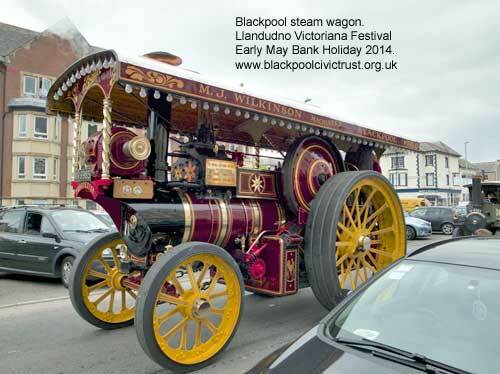 Early May Bank Holiday a group went to the Llandudno Victorian Festival. 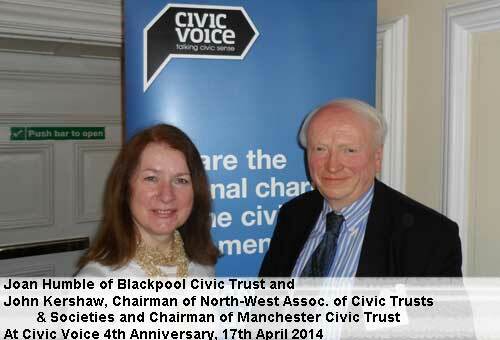 Joan Humble represented Blackpool Civic Trust at a special event on April 17th in London to celebrate the fourth anniversary of Civic Voice. 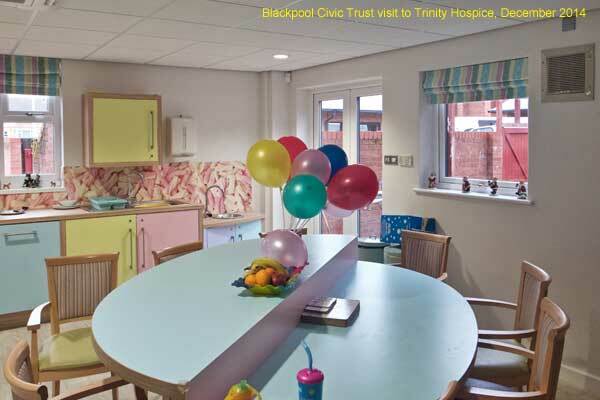 This charity represents 290 local civic trusts and societies, including Blackpool, at a national level. The event also saw the Inaugural Sandys Lecture in honour of Lord (Duncan) Sandys and the launch of “A brief History of the Civic Society Movement”, which tells for the first time the story of one of the country's oldest social movements. 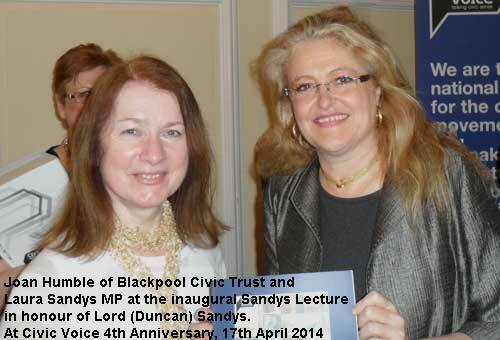 Photo: Joan Humble, Chairman of Blackpool Civic Trust, with Laura Sandys MP. Joan Humble with John Kershaw, Chairman of North West Association of Civic Trusts and Societies and Chairman of Manchester Civic Trust. Friday, 25th April 2014 @ FYCreatives, Blackpool. 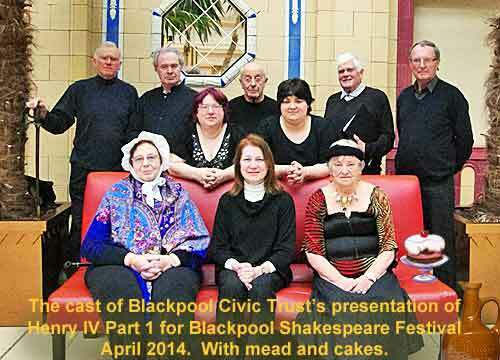 Blackpool Civic Trust gave a tremendous performance of Henry IV Part 1 and received many compliments from members of the audience, for which we're very grateful. We tried to make it as varied and interesting as possible, using Shakespeare's own words, an extract of Orson Welles'film Chimes at Midnight to illustrate the battle scene and cakes and biscuits baked to recipes of the time. The audience certainly liked trying out the mead and cakes!! It was very rewarding. At the first rehearsal we didn't think we'd succeed but after weeks of practice we managed to give the audience a flavour of what the play was about and interest them in finding out more. We were pleased that Councillor David Owen found time to join us because the Shakespeare Festival was his idea. We were also joined by Councillors Ivan and Sylvia Taylor and Coun Christine Wright who had themselves taken part in the Council's production of Richard III on Wednesday night. We would also like to thank FYCreatives for making the room available to us and finding extra chairs when more people arrived than expected. 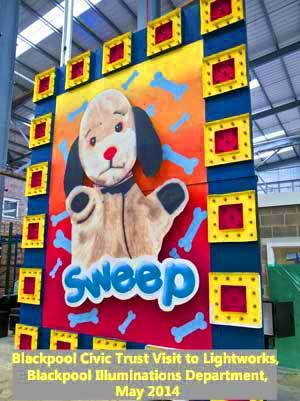 The proceeds of our raffle will go to the Mayor's Charity. Our photographer didn't take any photos so here's a shot from Stratford upon Avon. Do you think it looks like our production? 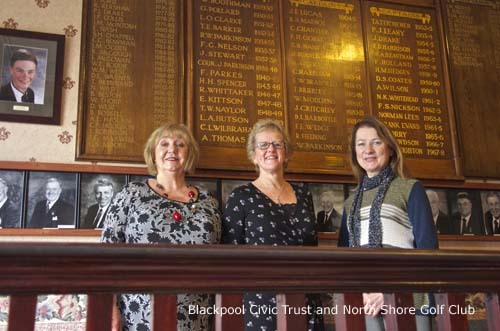 Joan Humble, Chairman of Blackpool Civic Trust, has been appointed as a trustee on the Board of Civic Voice, the national charity for the civic movement. 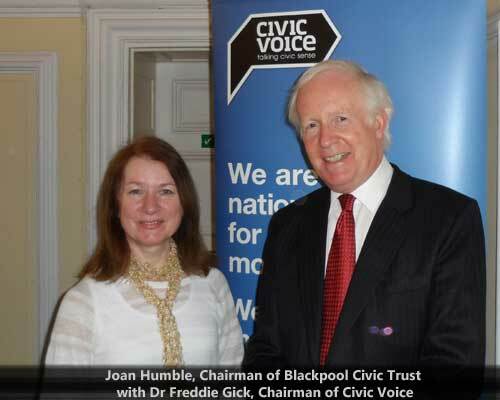 Mrs Humble said: “I was very pleased to be asked by Dr Freddie Gick, the Chairman of Civic Voice, to join this important national campaigning organisation. 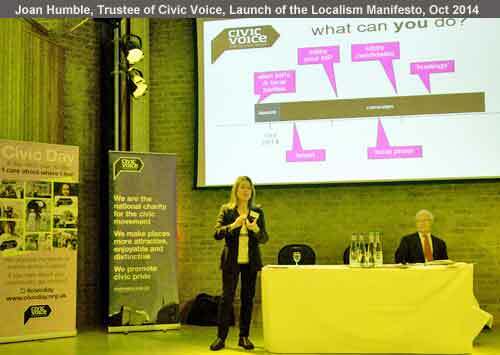 Civic Voice represents 290 civic trusts and societies with 75,000 members. 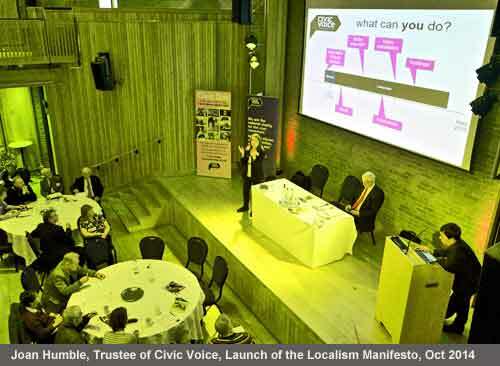 (1) The photograph shows Joan Humble and Dr Freddie Gick at a recent event in London, which marked four years since the setting up of Civic Voice to replace the former Civic Trust. (2) Joan Humble and Griff Rhys Jones, President of Civic Voice, at the above meeting in London. 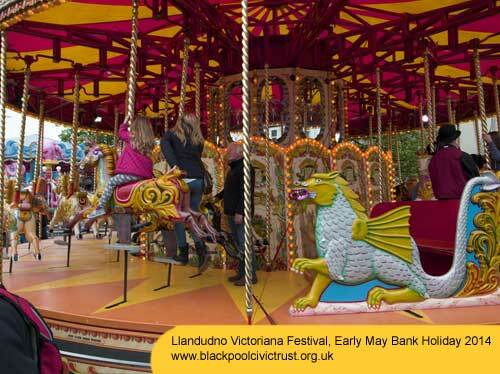 The idea for the festival came from Deputy Mayor of Blackpool, Councillor David Owen. 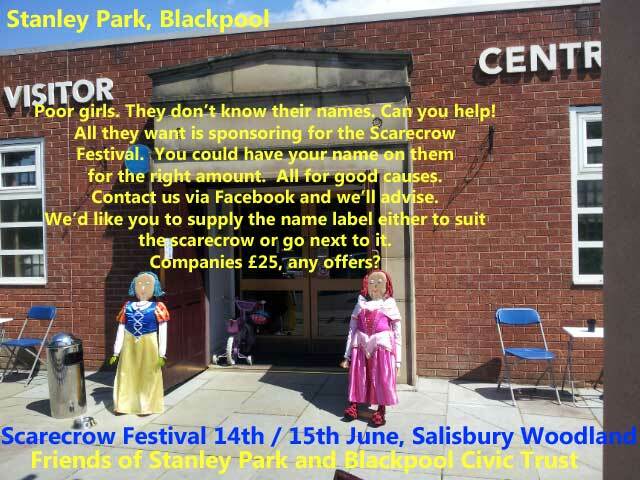 The performances will be open to the public, and free, it is hoped to raise funds through donations and any received will benefit Snow Heights, a charity helping schools and young people from the Fylde Coast. 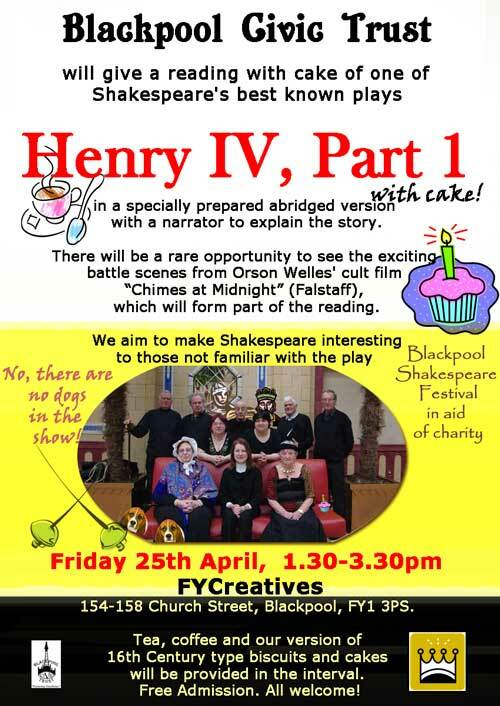 Blackpool Civic Trust will provide a reading of one of William Shakespeare's best known plays : Henry IV Part 1, an abridged version with narrated explanation and battle scenes filmed by Orson Wells. Venue: FYCreatives, 154-158 Church Street, FY1 3PS. 25th April. 1.30pm to 3.30pm. Download a white version of the above poster, click here. 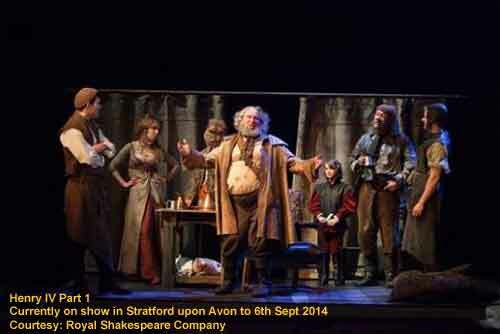 With his crown under threat from enemies both foreign and domestic, Henry IV prepares for war. We hope to make the play accessible and interesting to those who are not familiar with it and offer our own interpretation to those who do know it. Exhausting rehearsals have been held for the past two weeks and want to do justice to Shakespeare's language and to an exciting time in the history of this country. 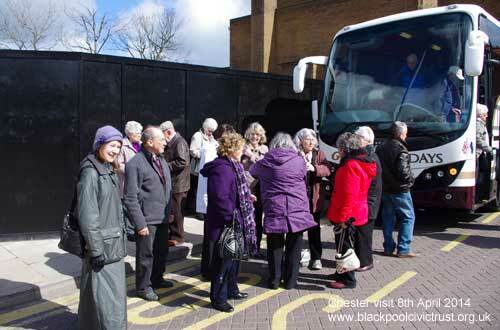 A coach full of Civic Trust members visited Chester on April 8th. 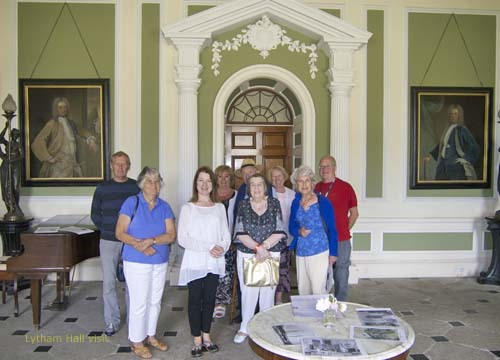 The trip was organised by our Event's Officer, Betty Bradford, with her customary efficiency and gave members the opportunity to see the history and heritage of this ancient city. 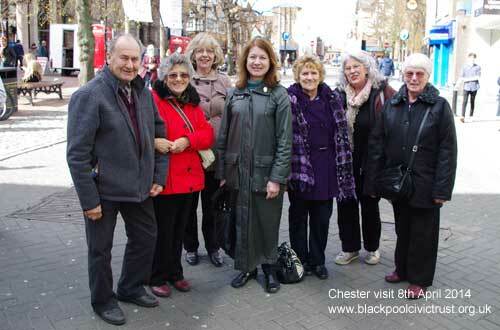 Upon the arrival of the coach in Chester the group was joined by a qualified and lively guide, who explained the long history of the city as we were driven around. After the guided tour we had an opportunity to explore the city on foot for nearly five hours, enjoy lunch and, perhaps, squeeze in the odd bit of shopping. 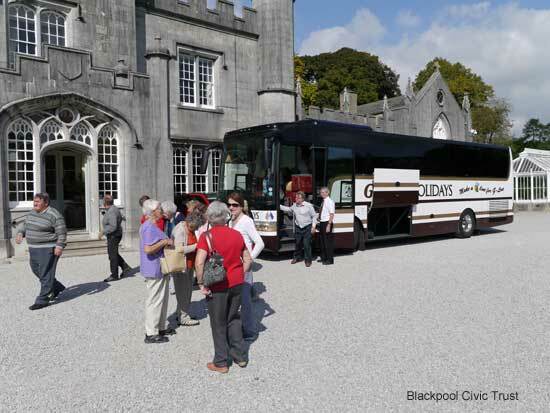 Joan, our Chairman, said “It was a very interesting, enjoyable day with so many beautiful buildings to see and explore”. 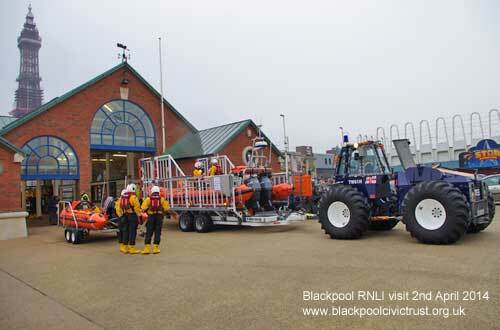 On April 2nd a large group from Blackpool Civic Trust visited Blackpool's Lifeboat Station and met the volunteers who work there. 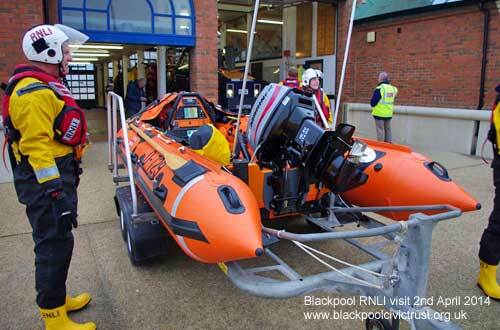 Joan Humble, Chairman of BCT, said “We were very pleased to visit in the 150th anniversary year of Blackpool's Lifeboat Station. We had a very interesting and informative visit, learning about the different lifeboats, the volunteers who man them and those who support them in other ways. 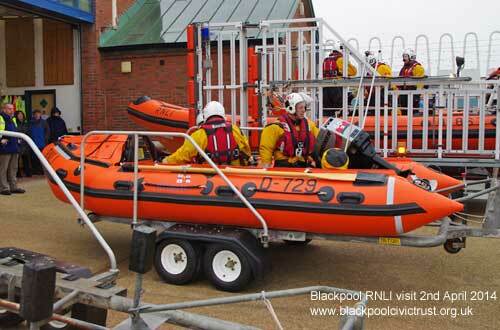 It was particularly interesting to witness the launch of the lifeboats as part of the regular training exercises. 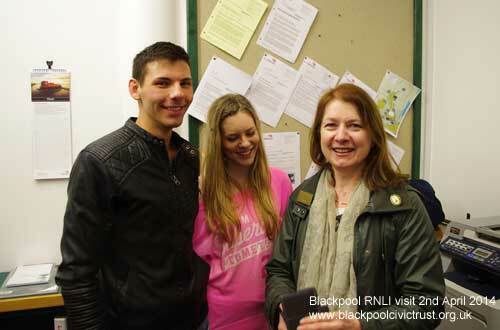 We also met two students from the University of Chester who are making a film commemorating the 150th anniversary of the first Lifeboat Station in Blackpool. The Civic Trust later made a donation to the RNLI to support its essential work. Photo of Joan with students, Rhys Bennett & Pip Biggs. 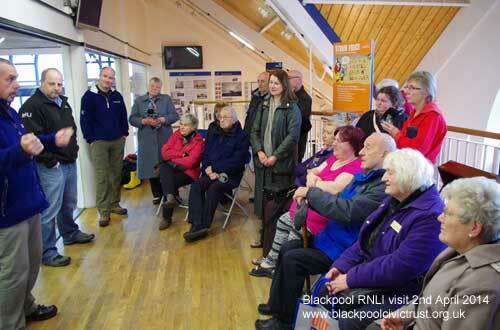 Pip said that she “felt privileged to produce a film on the RNLI, which is a wonderful cause”. 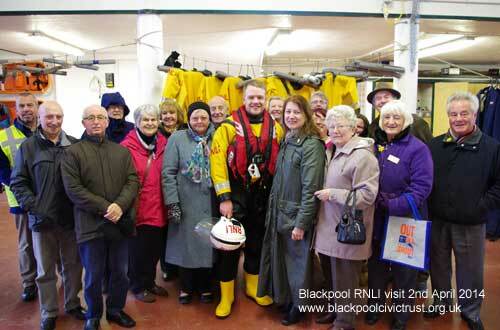 Rhys added that he “hoped people would remember the importance of donating to the RNLI, especially in this anniversary year for Blackpool”. The 2013 Awards were presented in the Sponsor's Lounge at Blackpool Football Club. Our guest speaker, Gerry Wolstenholme, explained the importance of the development of the club as Blackpool itself grew. 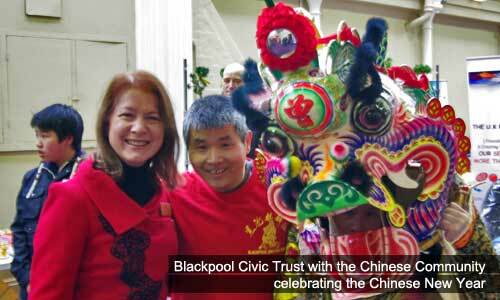 The Civic Trust was very pleased to support the local Chinese community by joining in with their celebration of the Year of the Horse. 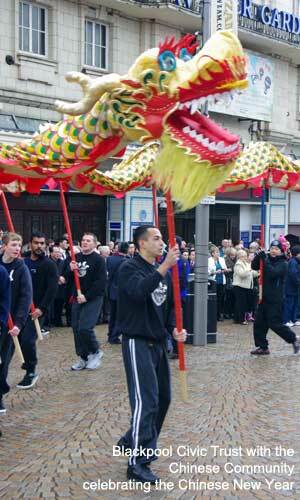 The dragon dance outside the Winter Gardens was extremely colourful, suitably noisy and hugely entertaining – a welcome contrast to the grey day. Besides celebrating the Chinese New Year, we were able to publicise the important work carried out by the Trust and discuss this with visitors to our stall. Thursday the 27th February we will be holding our Annual Awards Dinner. 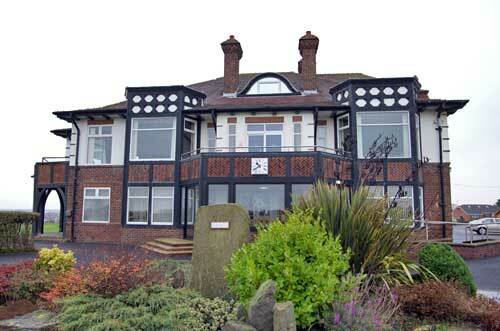 The 2013 Awards will be presented in the Sponsor's Lounge at Blackpool Football Club. Our guest speaker, Gerry Wolstenholme, will explain the importance of the development of the club as Blackpool itself grew. Tickets will be on sale at the December meeting and into the New Year, priced at £30 each, (Corporate Members £270 for a table of 10). Crich Tramway Village have requested our assistance with preparing an attraction that sums up early Blackpool and the Golden Mile. 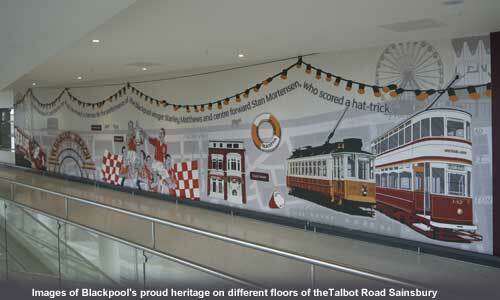 Events promoting Blackpool need to put on the best face of our resort so any of the tram, history enthusiasts or anyone willing to help please let us know. 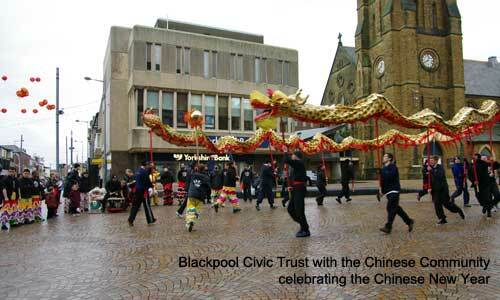 Blackpool Civic Trust will be making an entry to the event, please advise us if you wish to take part. 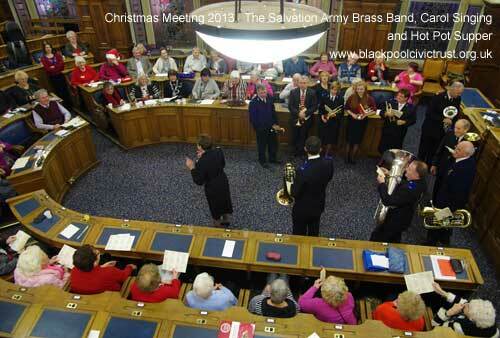 The Salvation Army Brass Band with Carol Singing & Hot Pot Supper. 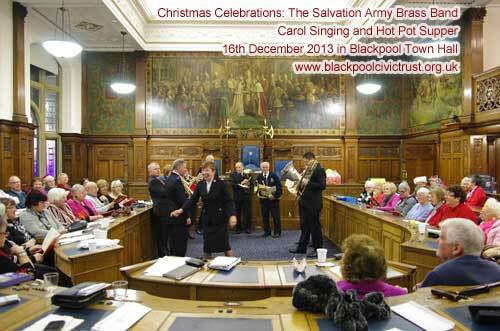 Our Christmas Celebration on the 16th December 2013 in Blackpool Town Hall. The Salvation Army Brass Band were excellent and so was the Hot Pot made by Denise. It was the trombonists birthday. Good view of the Council Chamber from the Public Gallery. 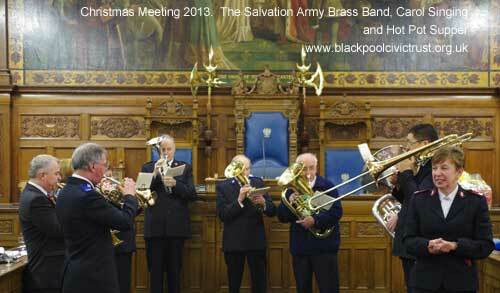 A close up of the Salvation Army Brass Band. 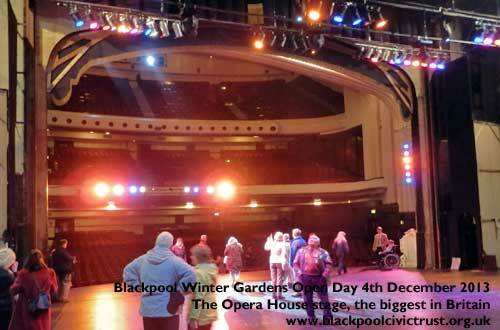 Blackpool Winter Gardens Open Day was 4th December. Fabulous building with all rooms open. Your customers will LOVE that you LOVEmyBEACH! Running a business in the North West means you know the importance of the seaside to your customers. In our recent survey, 94% of people feel that a clean sea is important when deciding to visit the beach. We’d like your help to make sure beaches and bathing waters in the North West are as clean as possible. You CAN make a difference and your customers will LOVE you for it! LOVEmyBEACH is a campaign with a huge challenge: to work together to keep our beaches and bathing waters clean. Our bathing waters are massively cleaner than they were 20 years ago but with new European Standards coming into force in 2015 there’s more to do. If bathing waters in the North West fail to meet the new minimum standards, signs could go up on our beaches advising people not to swim. This may mean visitors choose to go elsewhere. We don’t want that to happen and are sure you don’t either! We can all do something to help – you don’t have to be by the sea to make a difference. We’ve put together a Business Pack of information about how you can run your businesses in a beach friendly way and spread the LOVEmyBEACH message. Simple steps such as disposing of kitchen fats in fat traps or bins rather than down the sink or putting stickers on your toilets asking people to put disposable products in the bin, not the toilet, can make a real difference. Please do what you can, complete the checklist in the pack and send it back to us. We’ll send you a certificate and window sticker for you to show your customers you LOVEmyBEACH! We have created a special page for the Heritage Tram Tours, please click here to go to it. 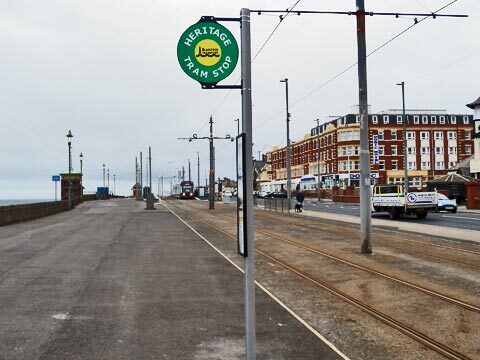 A Blackpool Heritage Tram stop. 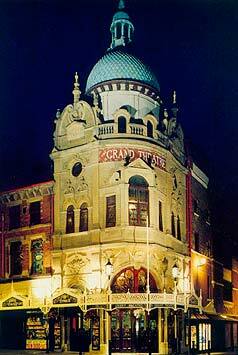 The Grade II* listed Grand Theatre, Blackpool. More beautiful inside would you believe!